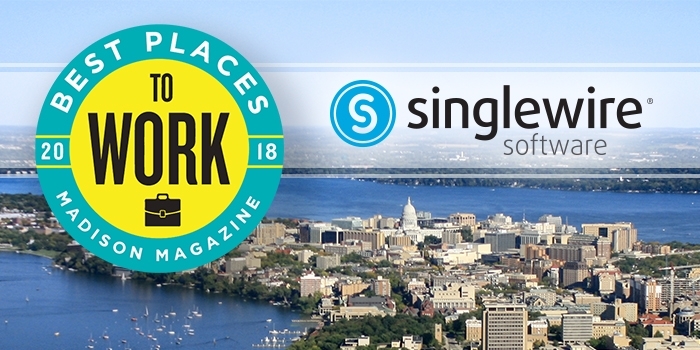 For the second year in a row, Singlewire Software, a leading mass notification technology developer, has been named one of the Best Places to Work in Madison by Madison Magazine. The company ranked second among mid-sized companies with 51-100 employees, moving up one spot from 2017. 125 local companies were nominated for Madison Magazine’s annual survey conducted by Omaha-based Quantum Workplace. The survey measures six categories of engagement: communication and resources, individual needs, manager effectiveness, personal engagement, team dynamics and trust in leadership. Singlewire Software’s InformaCast mass notification system helps organizations around the world keep people safe and informed. In the past year, Singlewire Software has moved into a new headquarters to offer employees improved amenities and has expanded its team to better serve its customers and drive innovation in the emergency notification field. To learn more about Singlewire Software and career opportunities available with the company, visit www.singlewire.com/careers.